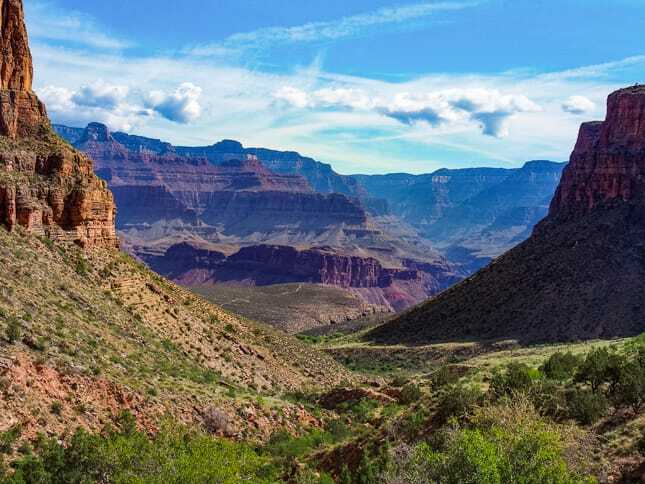 On this Grand Canyon Rim to Rim hiking tour you will hike from the North rim to the South rim and stay at famous Phantom Ranch, the only lodging at the bottom of the canyon! Our 3-day Rim to Rim trip begins with a night of comfortable camping before descending along North Kaibab Trail. You’ll carry only a daypack with the clothes you’ll need and your water, tonight we stay at comfortably rustic Phantom Ranch. 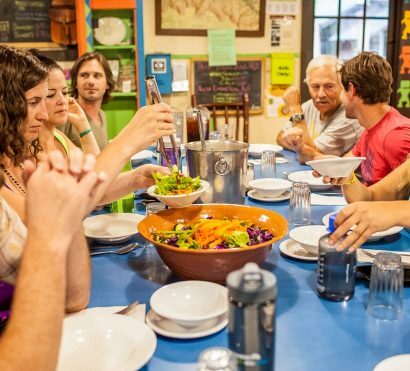 Experience this Grand Canyon treasure while getting to know fellow hikers over a cold beer and a hot dinner in Phantom Ranch’s canteen. Relax and soak your feet in the Colorado River to prepare yourself for tomorrow’s hike out along the famous Bright Angel Trail. 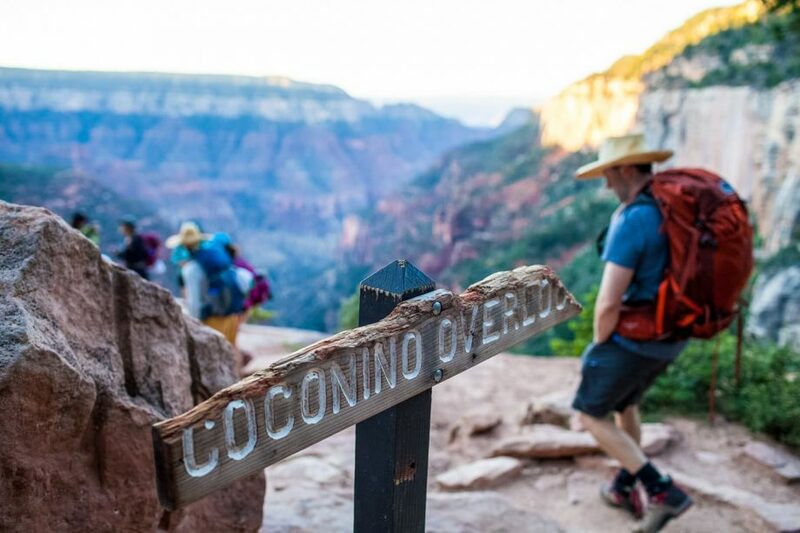 The Rim to Rim hike is 24 miles of trail magic and breathtaking views over 3 days, and your guide will lead you each step of the way. Hiking across the canyon in the summer requires an extra level of care and our hikes typically begin with an alpine start to get ahead of the heat. Accidental bonus of summer hiking? There’s nothing quite like a sunrise in the canyon. 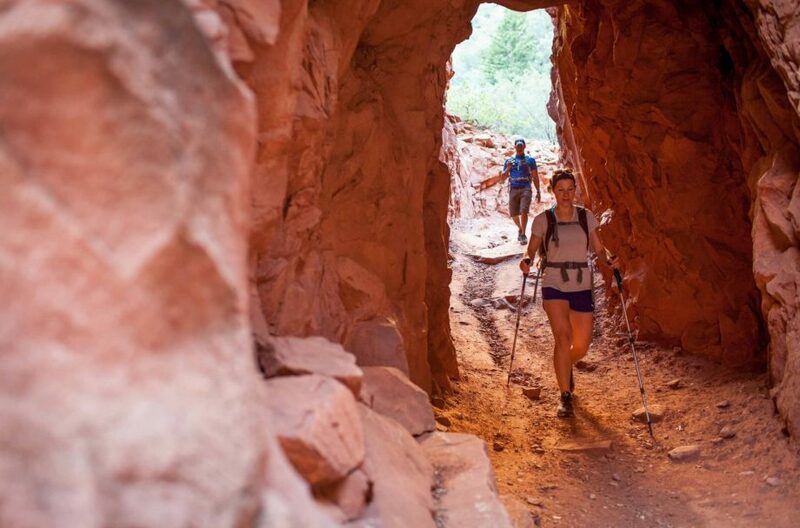 This classic Rim to Rim hiking trip is fun, adventurous, challenging, and sure to create one-of-a-kind lasting memories. Departure A - sold out! 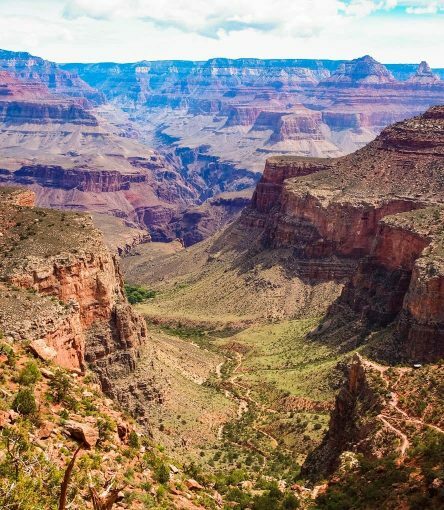 Hike Grand Canyon Rim to Rim over three days from the North to the South Rim. 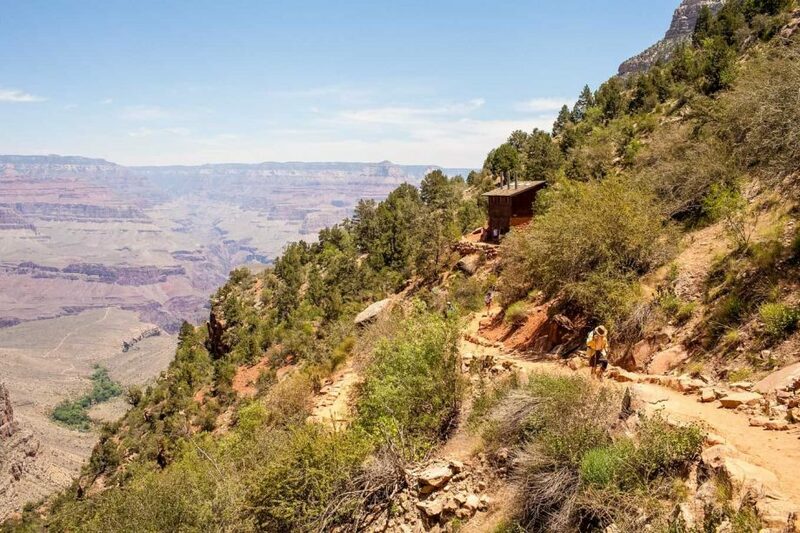 Carrying only day-packs, we begin on the North Rim of Grand Canyon and hike down North Kaibab trail to spend one night at world famous Phantom Ranch located in the bottom of the canyon. 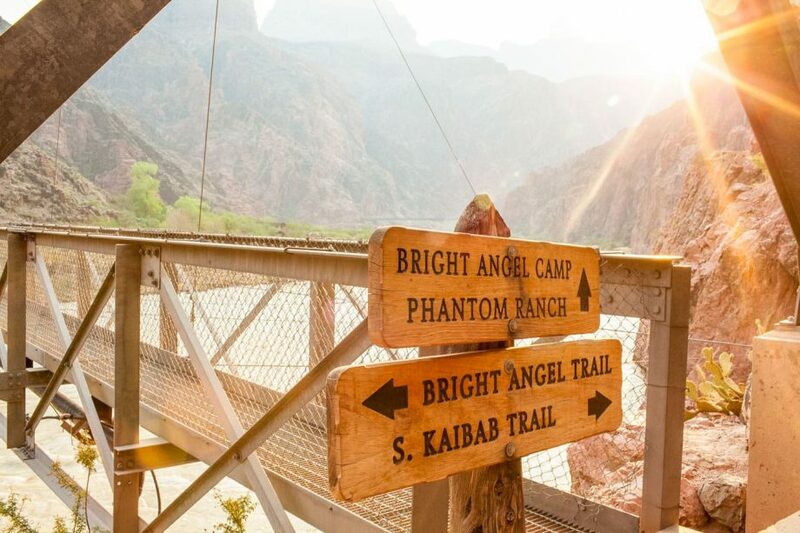 After a restful night staying in the dormitories at Phantom Ranch, we will make the long hike to the South Rim along the classic Bright Angel Trail. Join us on one of most desirable, and the most challenging, Grand Canyon hiking tours in the world. This is a strenuous trip for which we require a written letter of approval from your doctor. Trip End: Finishes in Scottsdale, AZ between 7-8pm on Day 3. 8:00am – Today we shuttle from Scottsdale/Phoenix to the Grand Canyon North Rim with some interesting stops along the way. We break at Cameron Indian Trading Post. Established in 1916, it is a famous showplace for fine Native American and Southwestern art, as well as a perfect lunch spot. 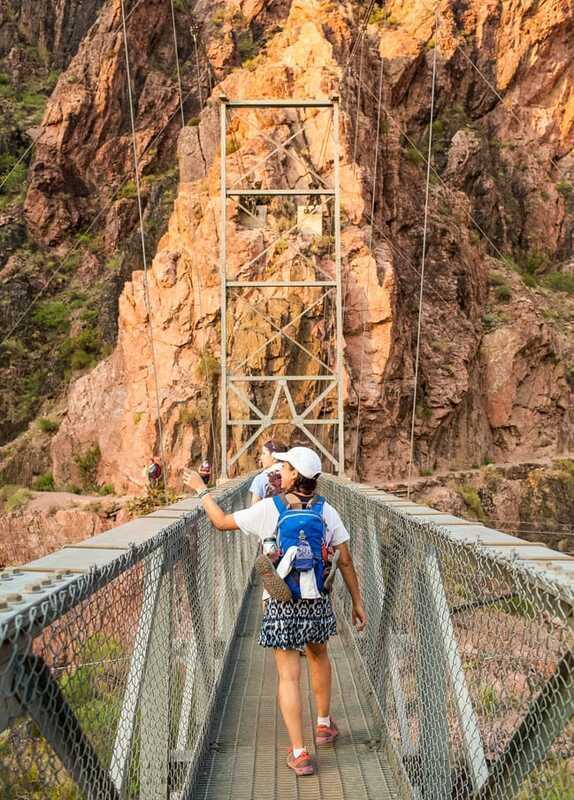 Then we’ll explore Navajo Bridge, just downstream from Lee’s Ferry which is the launch point for Grand Canyon rafting trips on the mighty Colorado River. Day’s end will find us setting up camp on the North Rim and enjoying a sunset stroll to stretch the legs before dinner in this spectacular setting. Get ready for a challenging trek into the heart of the canyon! Today’s descent is 14 miles and 5,700 feet into the grandest of canyons! On today’s trek we traverse through nearly every biological life zone in North America and can experience drastic temperature and weather changes. As we drop from the alpine to the desert, each step takes us thousands of years back in geologic time through ancient oceans, deserts, lakes and swamps. 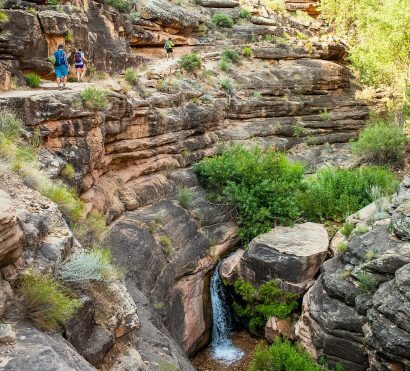 With mind-blowing vistas, fascinating trail design and workmanship, 100-foot tall waterfalls, and green spring-fed oases, the North Kaibab Trail is a national treasure. The end of our hike brings us to Phantom Ranch, nestled on the banks of Bright Angel Creek not far from its confluence with the Colorado River. Phantom Ranch was originally founded in 1903 as a hunting camp and named by Mary Jane Colter after nearby Phantom Creek. Heat Protocol: Today’s challenging 14 mile descent will begin with an “alpine start.” The exact timing will be at the discretion of the guide, but hikers can expect to eat breakfast and begin hiking well before sunrise. There is a certain allure to these early summer mornings. 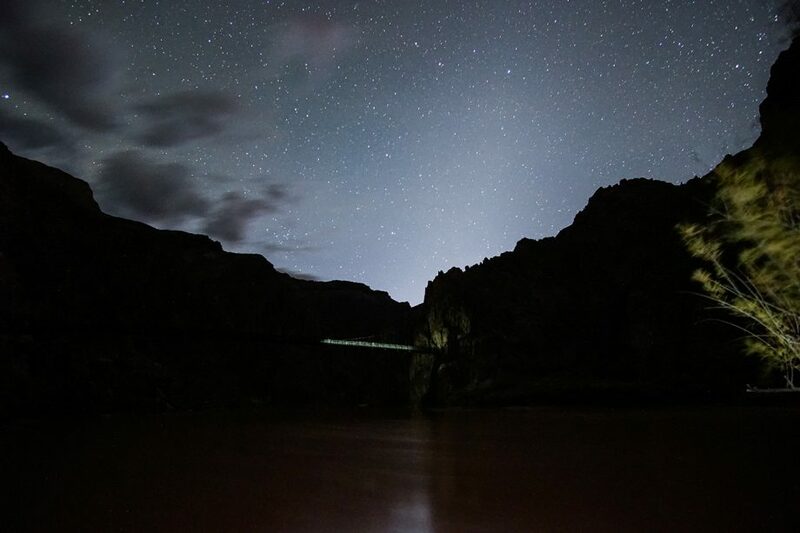 Grand Canyon’s North Rim is extremely remote which means there is very little light pollution and incredibly dark skies and bright stars! As the morning approaches, you’ll witness the canyon awaken and have the rare treat of experiencing your first canyon sunrise deep within the backcountry. 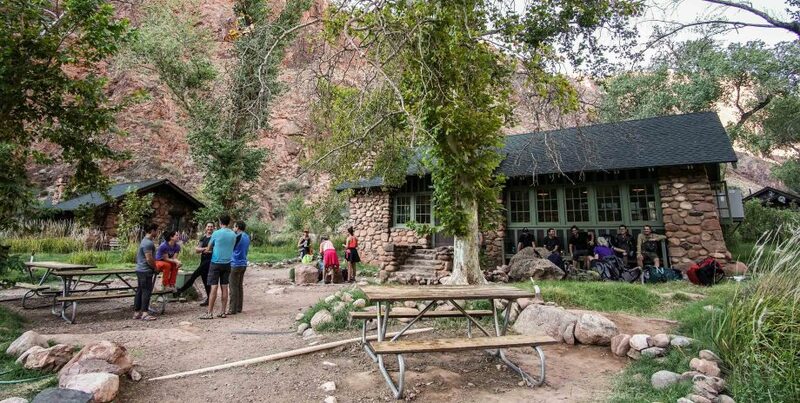 Arriving at Phantom Ranch at an early hour allows for more time to relax in the inner canyon, soaking your feet in the Colorado River or enjoying a cold beer at the Canteen. Today we are up before the sun and ready to conquer the canyon. 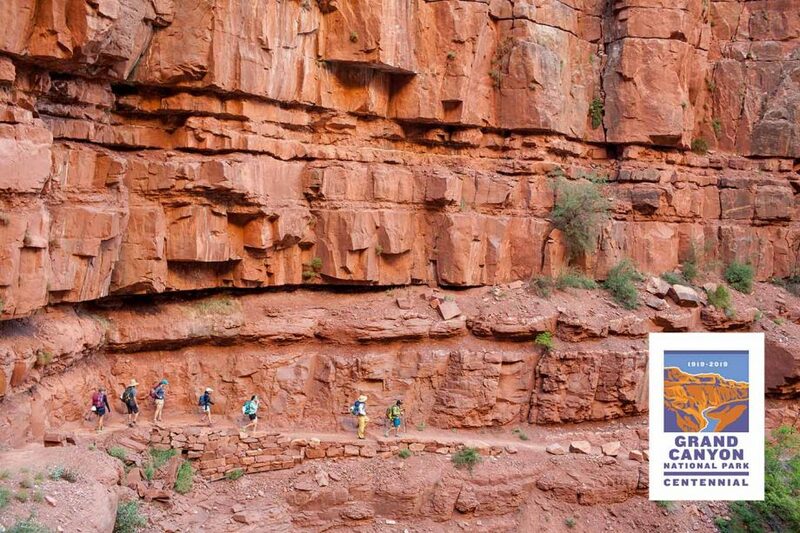 We will complete our rim to rim with an ascent up the Bright Angel Trail, a classic Grand Canyon trek! After crossing the Colorado River, the trail snakes its way up and out of the inner gorge to Indian Gardens, a welcome oasis. Here, we refuel and refill with water before tackling the steep ascent up Jacob’s Ladder through the Redwall layer. While always a tremendous challenge, your guides will provide you with helpful hints, strategies, and techniques to keep you excited and energized along the way. With proper preparation, hydration, and diet, the entire group will soon be high-fiving and hugging on the rim. We will celebrate our accomplishment and enjoy some free time to check out the many shops and museums at the South Rim Village. We will make a stop in Flagstaff for dinner, before continuing on to Scottsdale/Phoenix. We will return between 7:00pm‐8:00pm. Heat Protocol: As on your descent into the canyon, it will be extremely important to begin today before the sun is up. 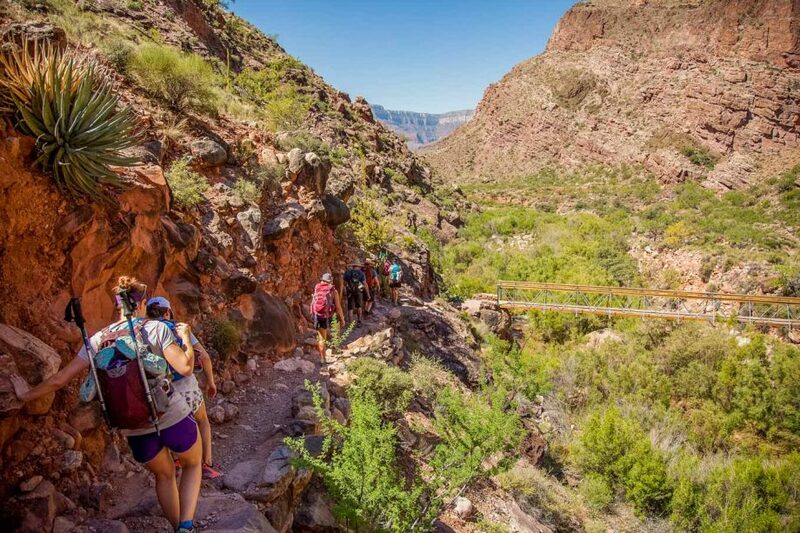 Hiking out of Grand Canyon is extremely challenging so your guide will be very conscientious of your water consumption and exertion as the temperatures rise. 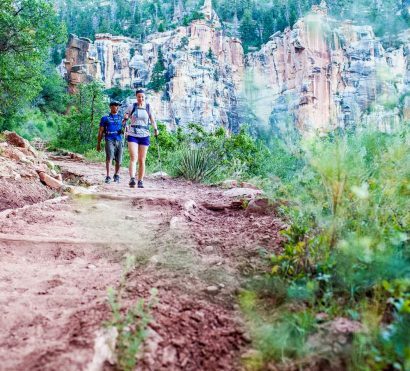 The hike along Bright Angel trail boasts the welcome oasis of Indian Garden approximately halfway through your hike. Depending on the day’s temperatures, group fitness and comfort levels, it is possible your guide may require an afternoon siesta at Indian Garden to wait out the hottest part of the day in the shade before continuing on to your destination at the Rim. Here you can relax beneath shady cottonwood trees and soak your feet in Garden Creek. We encourage you to take a load off and appreciate these extra moments beneath the bustle of the Canyon Rim. In the canyon we stay in the Phantom Ranch dormitories. These are gender-segregated rooms with comfortable bunks for 12 people. You may wish to bring earplugs for optimal sleep.